In the year 2015, a survey was carried out by the Centers for Disease Control and Prevention, in the United States of America, for a total of 2436 cases of acute Hepatitis C that were reported from the 41 states. However, the statistical data for the year 2015 was unavailable for the following ten states; Alaska, Arizona, Connecticut, the District of Columbia, Hawaii, Iowa, Mississippi, New Hampshire, Rhode Island, and Wyoming. From the data collected during the surveys, an increase was found in the overall incidence level of the disease. The incidence rate was seen to have increased than its 2011-2012 figures and now amounting to 0.8 cases for a population of 100,000 people. Since every case of the disease was not reported, therefore the estimated actual number of cases was estimated at being 13.9 times of the reported ones. Thus, after careful examination and making up for the lack of reporting or patient turn-up, it was estimated that 33,900 acute Hepatitis C cases occurred in the year 2015. 1 The exact number of acute hepatitis C cases that were reported in the year 2012 in the whole of United States increased by 44.3% from its 2011 statistics (from 1,230 cases to 1,770 cases). It also increased 20.2% (to 2,133 cases) from 2012 through 2013. And it increased by 2.6% (to 2,193 cases) from 2013 through 2014. 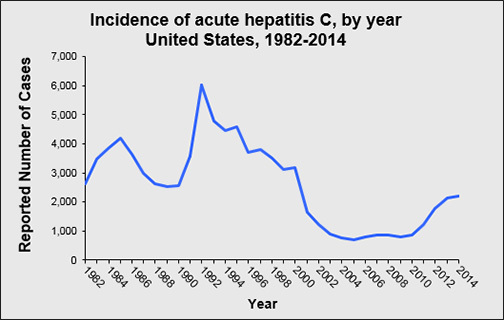 Compared with 2014, cases of acute HCV have increased by 11.0% (to 2,433 cases) in 2015. 2 From 2014 through 2015, the national rate of acute cases of hepatitis C increased from 0.7 to 0.8 cases per 100,000 population, which is an alarming issue for the country. 3 State-wise, for the year 2015, the actual rates of acute hepatitis C among the population could be seen as having no cases reported in North Dakota to a massive 3.7 cases for every 100,000 population in Massachusetts. 4 Out of the 41 states that were reported, the ten major affected states were Florida, Indiana, Kentucky, Massachusetts, New Jersey, New York, North Carolina, Ohio, Pennsylvania, and Tennessee. It accounted for nearly 59.6% of all the acute hepatitis C cases that were reported in the year 2015 and thereby posing them as states being unsafe for people instead of the Hepatitis C virus. Out of the reported 2,436 acute hepatitis C cases received during the year 2015, 69.6% of the times, the case-patient had jaundice. 63.7% of the times, the patient was hospitalized due to hepatitis C, whereas 54.1% death occurred owing to hepatitis C. As a matter of fact, only the more severe cases are expected to be reported rather than the mild cases. From the surveillance reports on the survey carried out by the CDC, it was found that the reported new cases of acute Hepatitis C showed an increasing trend every year with starting from only 694 in the year 2005 and growing to 2194 cases in 2014. The estimated actual new cases of the acute disease being around 16,500 in 2011 and increasing to 30,500 in 2014. The established number of chronic cases in the States has been estimated to be 2.7-3.9 million with the number of deaths increasing from 16,627 in 2010 to 19,659 in 2014. The total number of cases has shown an increasing trend from 2010 onwards thus making it a cause of concern. Hence, the statistics show the massive impact of Hepatitis C on people. Therefore, taking preventive measure to eradicate this virus completely becomes all the more important.